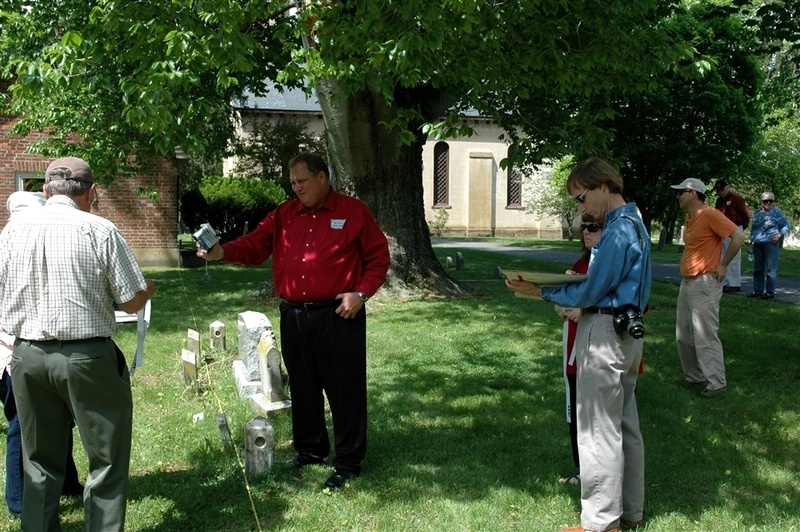 On Saturday, May 9, 2009, 30 people made the trip to St. George’s Parish and Spesutia Cemetery in Perryman, Harford County, MD for the 18th Annual Meeting of the Coalition. According to the historical marker on the property the name Spesutia is derived from Latin for Utie’s Hope, the name given to Colonel Nathaniel Utie’s 17th century Manorial Grant. 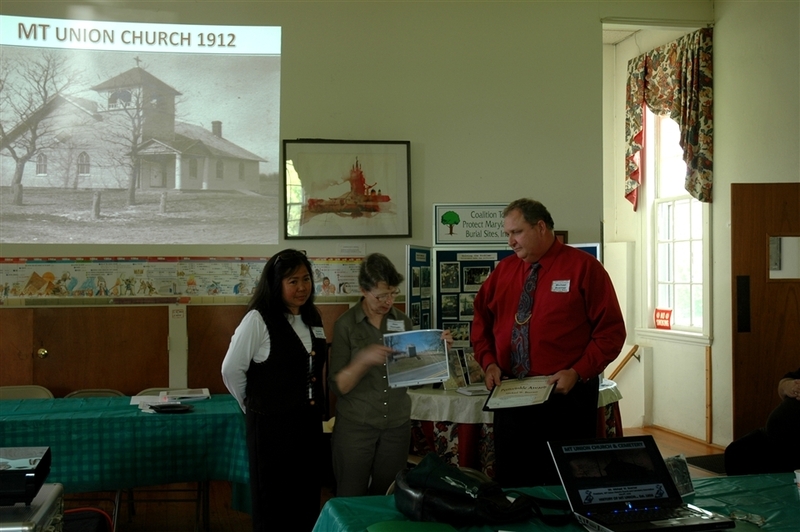 The members and guests were transported back in time as we met in the fellowship hall that was built during the 1930s. The church, which was opened during the afternoon for visitors, was built in 1851 and the vestry building which has been standing at the site since 1766 was likewise open for visitors. 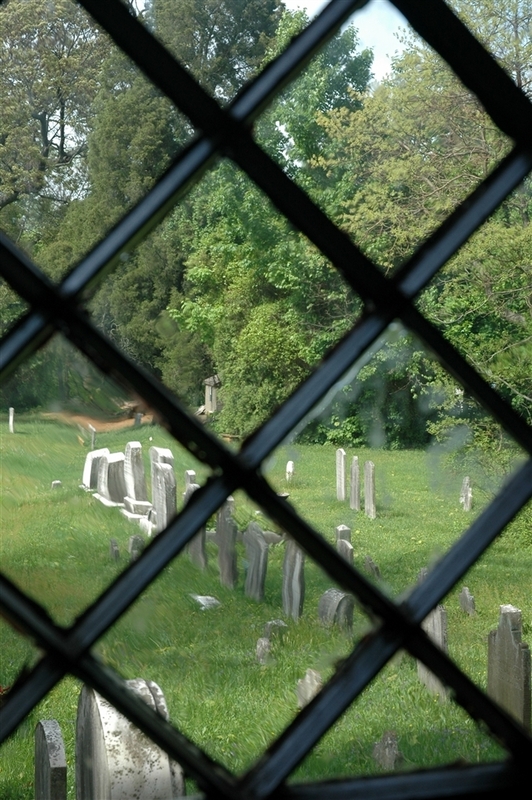 The cemetery contains some of the oldest burials in Harford County. The day began with the customary registration, refreshments, business meeting, and election of Officers and Directors. After the business items were dispensed with we introduced our keynote speaker Pamela Goffinet. Pam used her time in the morning to lay out background information on how she got started mapping cemeteries and the impetus for writing her book Mapping & Documenting Cemeteries. After Pam’s presentation, Ann Horvath presented two Periwinkle Awards. Ann was the entire Periwinkle Award Committee this year and she took on the project without complaint and did an outstanding job. Mr. Michael Boerner was presented the award for his work in Mt. 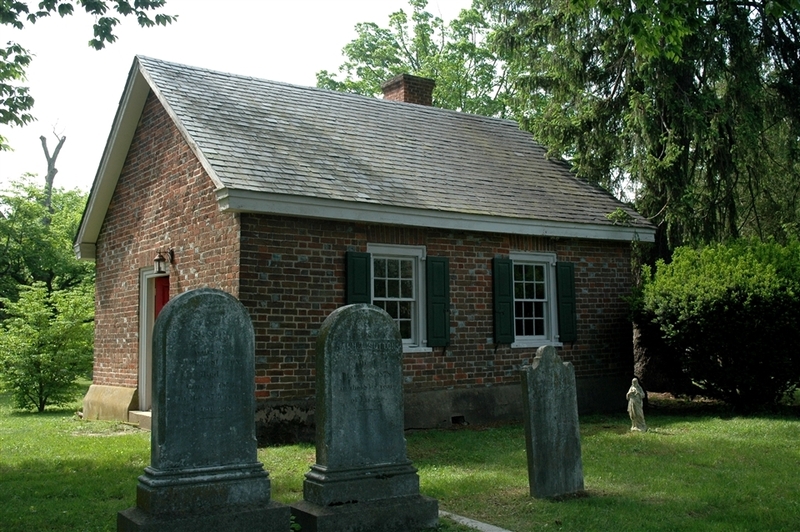 Union Historic Church and Cemetery in Carroll County and was nominated by Peggy Elliott. Mr. Gary Wasielewski received the award for his work at Cedar Hill Cemetery in Havre de Grace, Harford County and was nominated by the Executive Board of the Harford County Genealogical Society. Michael and Gary spoke for about 15 minutes each regarding their projects in their respective cemeteries. The talks were both informative and thought provoking. The group broke for lunch. Everyone had time to bid on items in our silent auction. This was out first ever silent auction. What is a silent auction you ask? Items being auctioned were displayed along with a bid slip. Attendees were invited to bid on the items by writing an amount on the bid slip and then signing their names to the bid. If someone else was interested in the same item they were instructed to write in a higher bid on the slip and sign their name. The winners of the items were the people with the highest bid on an item at the conclusion of the auction. Every item that was donated by our generous members was sold. Our gift shop, christened the “Ravens Roost” was open for business. 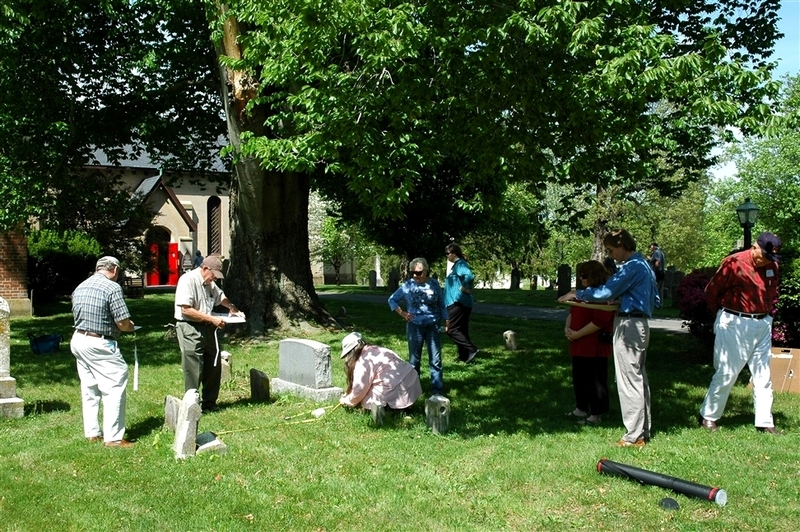 Mostly, the members spent time with each other discussing the events of the morning, talking about their cemetery projects, or asking additional questions of the speakers. Robert Mosko of Mosko’s Cemetery Services started off the afternoon with a discussion of conservation, preservation, and restoration of cemeteries. Robert had originally planned to work outside in the cemetery resetting a toppled stone, straightening a very “basic” leaning stone, and repairing a simple tablet that was previously repaired but had since failed. Even though the sun was shining on our meeting the rain of the previous 7 days prevented Robert from being able to set up his equipment and work safely in the cemetery. Always at the ready, Robert brought his PowerPoint™ presentation in lieu of his outside workshop. 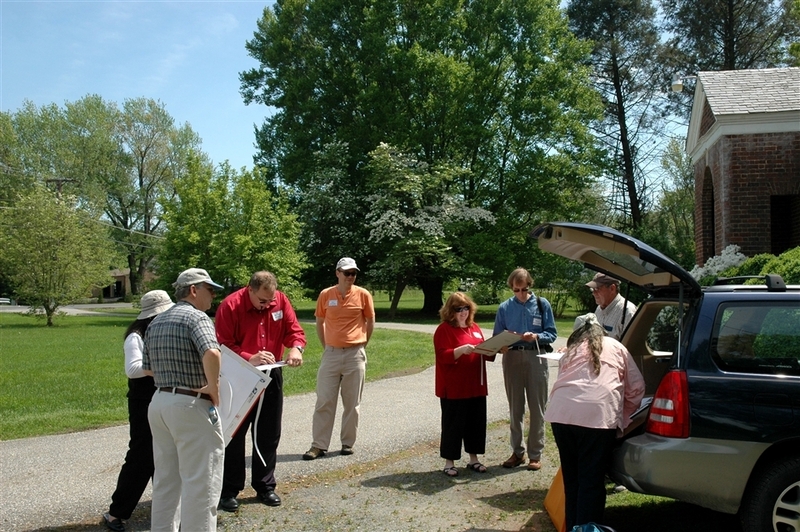 At the conclusion of Robert’s program a group headed outside to work with Pam during her mapping workshop. Pam is every organization’s dream speaker. The weather had been unpredictable all week so Pam prepared her workshop so that she could conduct it inside or outside depending on what the weather did Saturday. 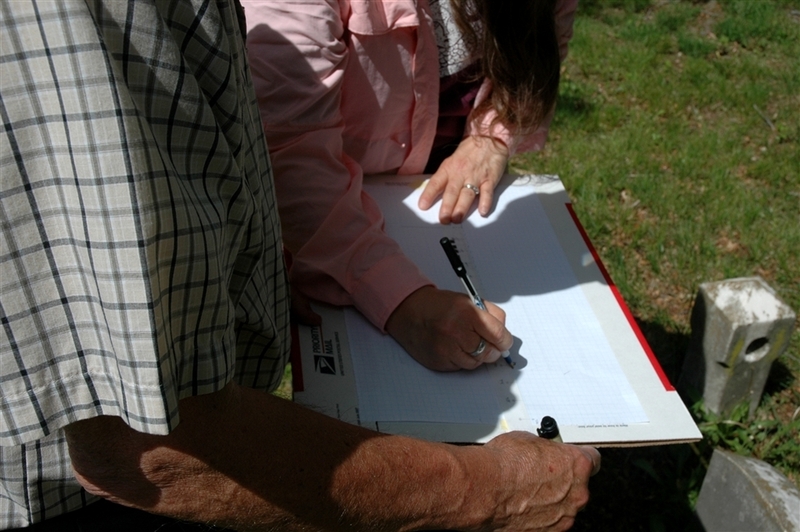 Pam dug out her tape measures, rulers, graph paper, and boards for the members to map part of Spesutia Cemetery using the Vestry building as a beginning point. 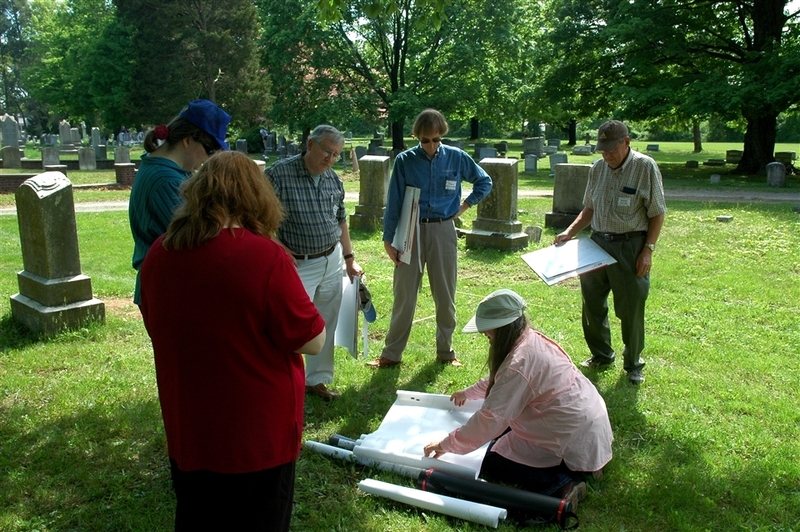 Her mapping process is ingenious and useful for groups or individuals planning to map a cemetery. Robert Mosko gave a brief outdoor talk to members. The group visited the stones that Robert had planned to work on had the grounds not be as saturated from all the rain. 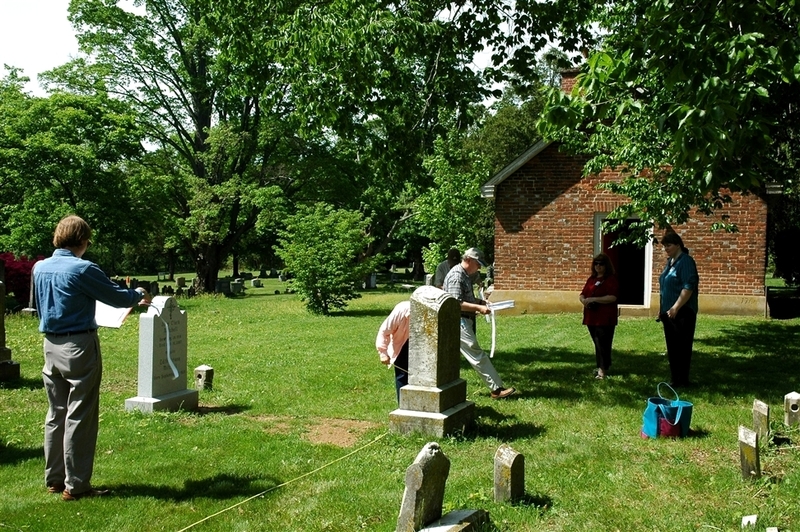 The last of the members drove out of the parking lot about 4:30 p.m.
Mapping Spesutia Cemetery, Perryman, Harford Co.